We LOVE Christmas in our house (how can you not?) We run through the house singing Christmas Carols (well I do and the Bugs say “MOM!! Can you stop singing those songs?!? You’re SO ANNOYING! 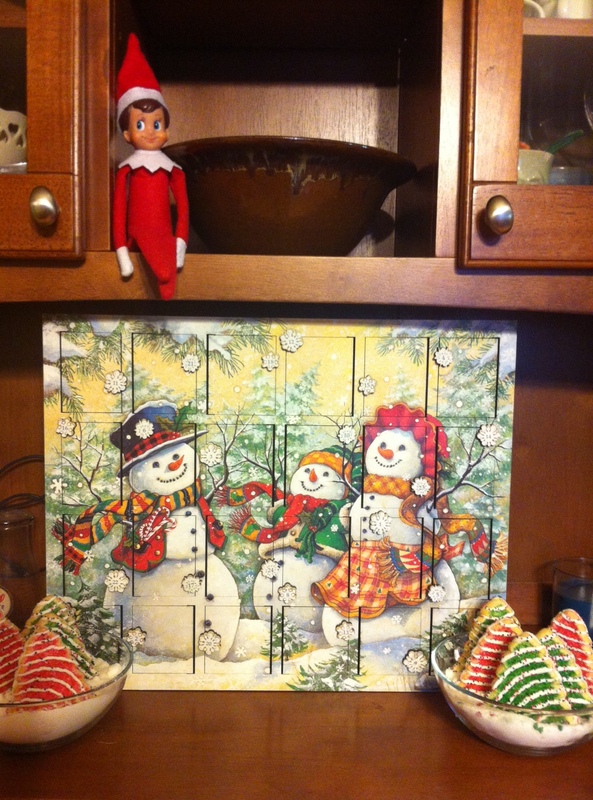 ), we check our advent boxes daily (Bug does odd days and LoveBug does even), we search for Kirby our elf each morning to see where he might be hiding and we leave Christmas lights on always! This year is the 2nd year that the Bugs have made their lists with the intention of LIMITING the gimmies. They ask for: something they want, something they need, something to wear and something to read. I find it really helps with the infectious gimmies. I’ll take anything that helps because it is tough trying to tame the gimmies, teach appreciation to 2 young kiddos when they have been so fortunate to never want for anything. They are the only grandbugs of 4 sets of grandparents, only niece/nephew of 4 aunts/uncles and still are lucky enough to have great grandparents. Not to mention Mommy & Daddy…and SANTA! Today we will start the festivities with a family Christmas…during what is expected to be a big snowstorm! My house doesn’t look like all of the pinterest rooms I pinned, I didn’t make all of the crafts I wanted and the cookies aren’t all baked. We don’t have our tree yet but in about 1/2 hour my house will grow by another 6 people for the next 36 hours. It will be loud, crazy, joy*full and I can’t wait to see the huge smiles on my Bugs faces! You can’t escape Elf on the Shelf…it’s EVERYWHERE! 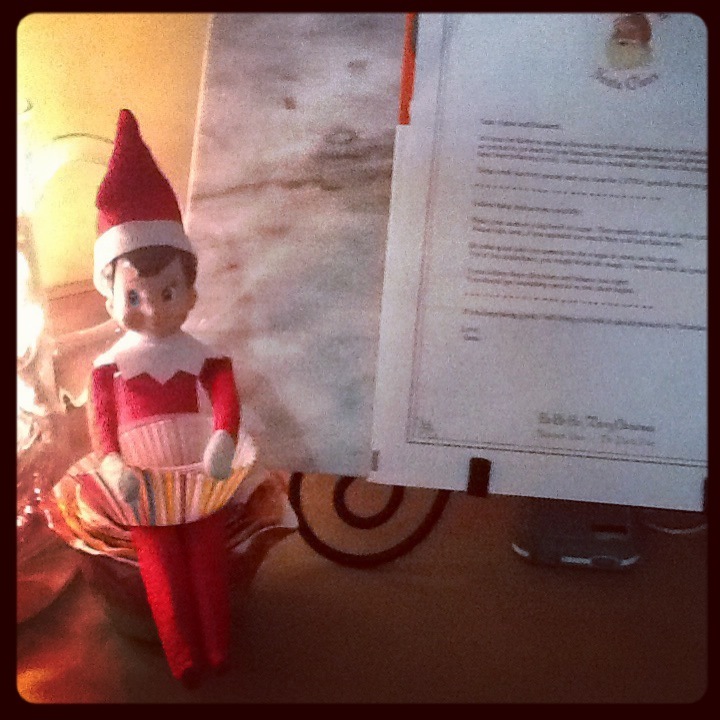 For the next 25 days facebook, pinterest, twitter, kids at recess…stories of what the elf has been up to will be shared. The Bugs really get excited about Kirby (our elf) and this year is no exception. I only hope I can remember every day to move Kirby to a new spot and be creative enough to inspire the Bugs to be well and do well. In our house, our elf arrives the morning after Thanksgiving. This year Kirby arrived with a letter from Santa and “magic seeds.” I can’t take credit I got the idea from…where else…Pinterest. I found a blog post to livinglocurto.com with this fantastic idea! I did it a little differently: tree shaped sugar confetti instead of colored chips. The Bugs LOVED it! 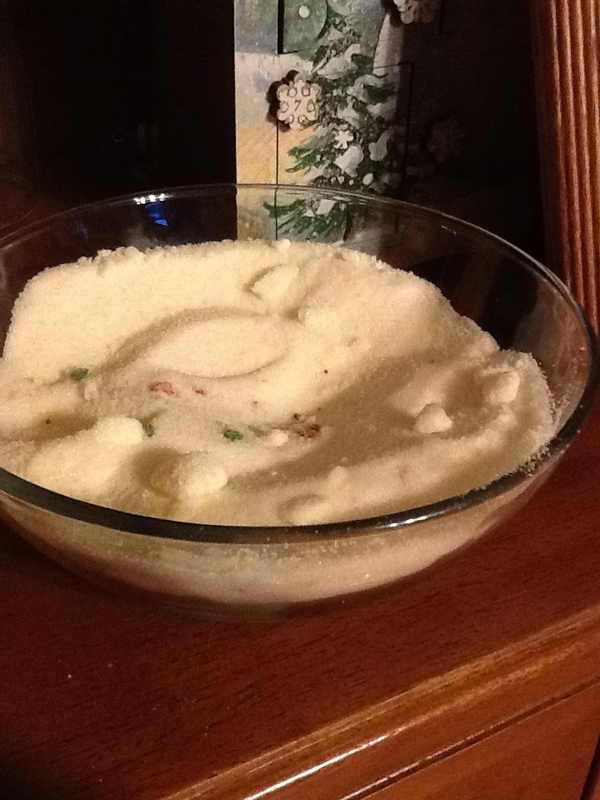 The letter (from Santa) instructs them to plant the “magic seeds” in a bowl of sugar and sprinkle salt over them each day until they “grow.” They had (messy) fun planting their seeds! And today Kirby returned with the snowman advent calendar and the magic seeds GREW!!! Such excitement….they can’t wait to see what Kirby will do next! I love that they are so excited! I am so excited about the opportunity to build off their excitement for the next month…I hope I can keep up the momentum! Do you have an elf at your house? What are your favorite Elf adventures? Share them here and help a momma out!